Our unique event space has panoramic views of the surrounding wetland. I love this space! It has been so wonderful to have as our learning place! Sarah came to Clarus Center for professional training that included several modules that spanned the four seasons of an entire year. She captured the view from the event room in each season. To check availability of the event room and for more information please call 630-248-6575. Leave a message and someone will return your call. Come see the beautiful space at Clarus Center, looking out through a wall of windows into a stunning nature scene, including a pond and wildlife…and on the opposite wall a fireplace for those cold winter days. It is one of the most beautiful, sacred yoga spaces I have taught in. The amount of natural light in the room, the warm wall color, and rich wood floors are easily soothing to the mind and energizing to the spirit. 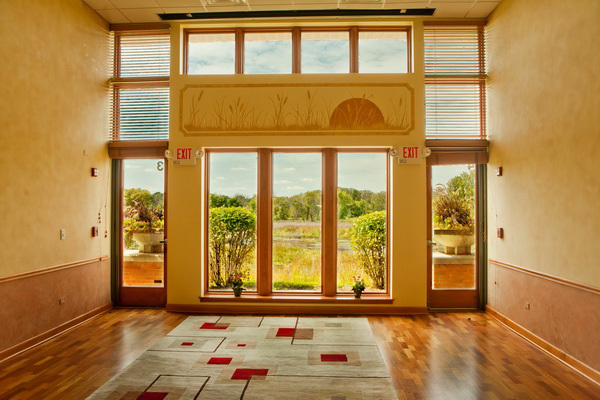 If you are new to yoga, we so encourage you to walk through our door and allow the gorgeous view and surroundings to remind you to clear your mind of worries and struggles and to simply be present. We offer a variety of Yoga classes, including UZIT (Urban Zen Integrative Therapy). Pamela Hunter runs the Yoga studio at Clarus Center.